It’s not everyday that you get to witness attempted vehicular manslaughter, but that is exactly what I got to see today standing outside the most ghetto authentic Mexican restaurant in Simi Valley. From what I could tell, this crazy lady was attempting to run down her male acquaintance right in front of me. She even went after him, screaming out the window the whole time, when he crossed the street into another shopping center. 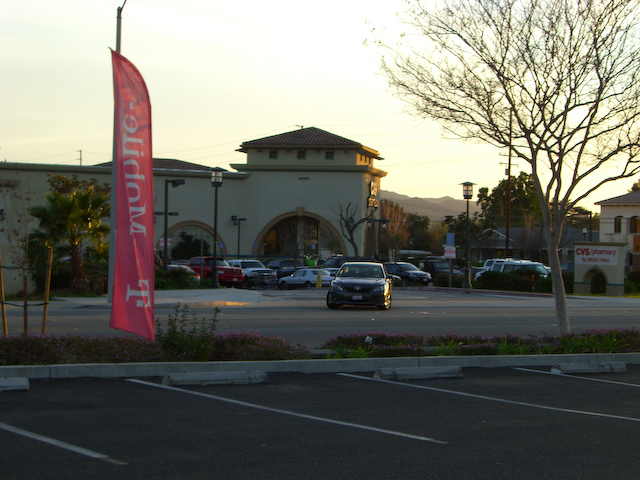 I am kicking myself for not getting to my camera faster, but here’s a pic of her BACKING INTO the shopping center to stalk her prey. I don’t count this place as a chain restaurant because I have no idea where Taqueria Jalisco #1 is. (Mexico, perhaps?) 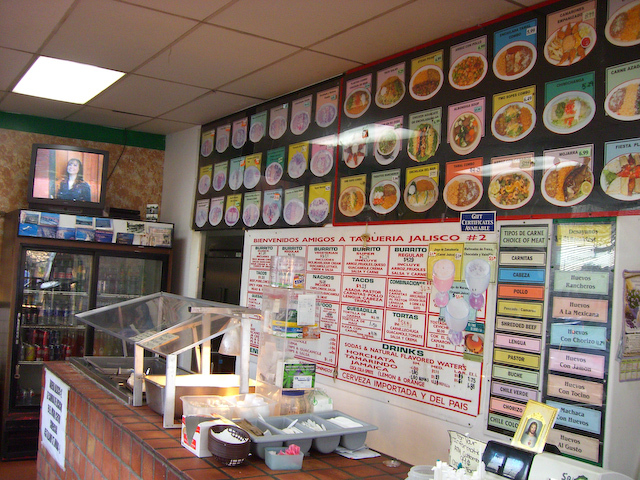 If you read this and know of the whereabouts of Taqueria #1, please email us at info@eatmecalifornia.com. As soon as I walked through the door of this place, I knew I was in trouble. You see, I am a chronic menu reader. I know it’s a problem, but I need to know everything a place offers in order to make my decision on what to order. Well, at least this time I had some pictures to help me choose from the 8 trillion options. Don’t be afraid to bring the whole family. 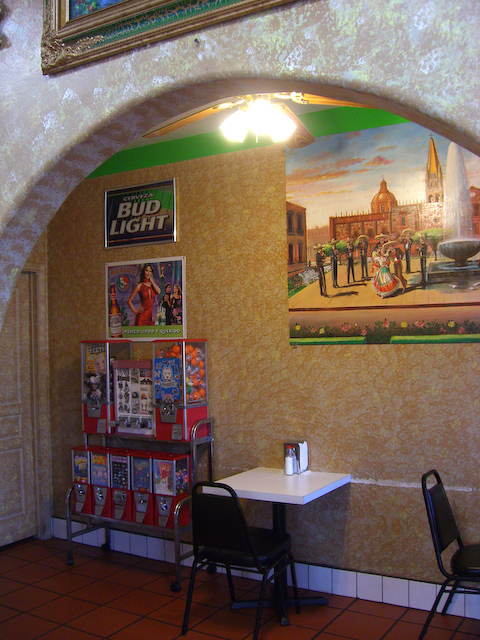 If you have a Quinceañera, or even a first date, you can choose to eat in their lovely clean private banquet room. Because I am a man of the people, I decided to sit in the regular dining room. But then the other guy took off and I was instantly regretting my decision, left sitting alone with the telanovelas and my combo plate. Speaking of combo plates, I ordered the carnitas tamale plate and two of their little soft tacos, one carne asada, one carnitas. I decided to stay away from the chips and salsa because I couldn’t tell how long they’d been sitting out. After tasting how fresh my food was, I’m sure they were fine, but the presentation was a little janky for my tastes. The highlight of the meal was the carnitas tamal. (I call it a tamale but the lady behind the counter said tamal.) It was spicy and had plenty of meat. The red sauce they served with it had a soup-like consistency that helped keep the tamal nice and moist. The beans and rice were average on their own, however, if you mix them up and add a little of the leftover tamale sauce to the mix they turn into something special. I guess that’s why people always say beans & rice like it’s one word. They’re like the peanut butter and jelly of Mexican cuisine. After working diligently on my combo plate, I shifted gears and went for the tacos. These are the little guys served in two mini corn tortillas. The carne asada was a little rubbery, but the salsa verde they added to the taco helped. It had this minty finish that contrasted with the almost sour taste of the verde. The carnitas taco was served with a pico de gallo. 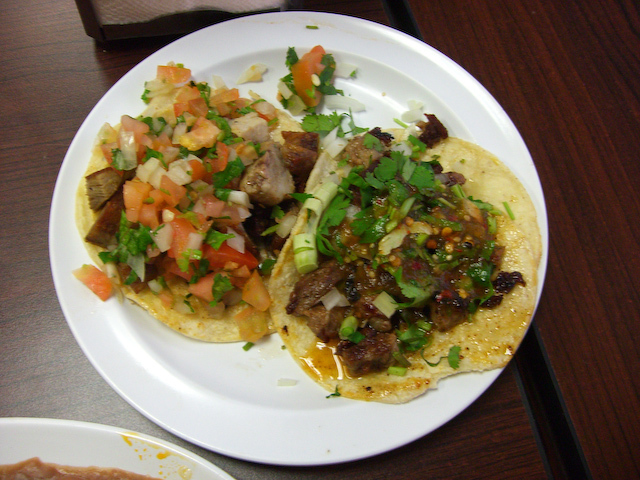 It was dry compared to the verde on the asada taco, but the carnitas was more moist so it balanced out. Overall, I would definitely go back to this place. 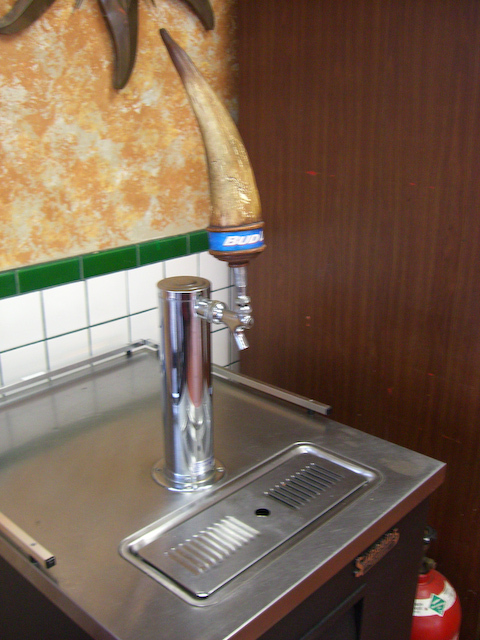 I love authentic Mexican food and this place is so authentic I’m afraid to drink the water. 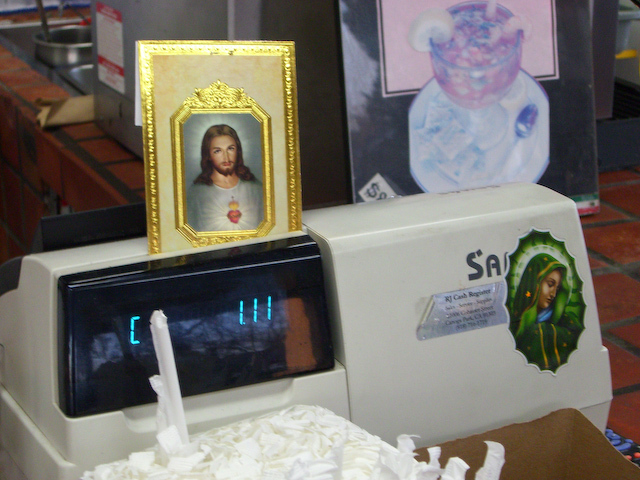 They even have Jesus on the register. WWJD? Order some freakin' tacos, that's what! Now if you’ll excuse me, as is customary with all Mexican food meals, I will be out of contact for the next 30-45 minutes. Call it the cost of doing business. Crazy woman running people over with her car. Can you find me a mexican place that makes chichurron pork skin tacos? There is only place I know of on LA Ave that makes them. There has to be another place. Oops. I thought I commented on this already. I love the banquet room. I’m sure Taqueria Jalisco gets a lot of business from that room alone. The tacos look great. I am personally addicted to mexican food. I keep trying to get people to teach me how to cook it so I don’t go broke and die alone in a trailer, surrounded by cats and empty take-out containers from all Mexican joints within a 30 mile radius. So anyway, thanks for the review. I’ll be swinging by there next time I’m in Simi. 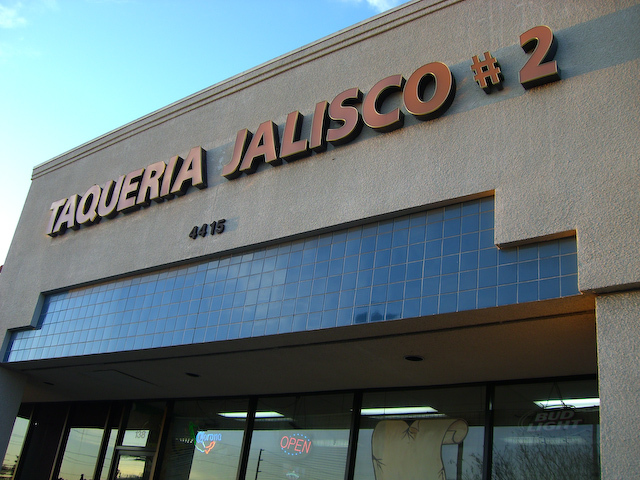 Taqueria Jalisco #2 has great Mexican food. When I first went in there I was a little afraid, but after I ordered the Manchaca burrito I was hooked. 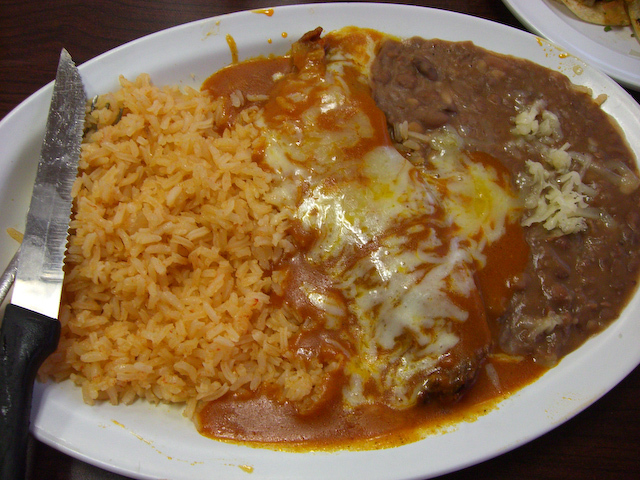 When ever I am need a little fatty delight I head over the the Taqueria. Not sure about TJ#1, but TJ#3 is on LA and Erringer… Frigging the best mexican food around. Eat the chips and salsa, they’re always fresh and super delicious. The just put another one up in Moorpark on LA Ave (not sure on the number, 6 perhaps? ), its just as good as TJ#3. Thanks for the tip, Ben. The chips and salsa were pretty scary at this location. I’ll definitely check out the L.A. and Erringer location though. Still, I wonder why there’s not a TJ #1 somewhere? I still maintain that it is in the motherland.